In this webcast, we will look into some easy steps you could take to run vulnerability scans against web applications. 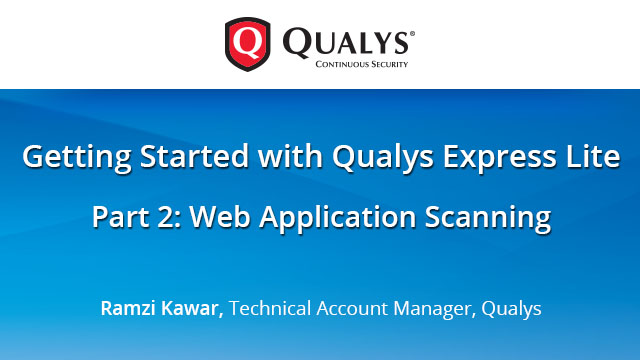 We will show you step-by-step how to configure Qualys Web Application Scanning, execute discovery and vulnerability scans, as well as run reports and create a strategy for remediation. Containers are the most sought after development tool for microservices. Their simplicity and portability allow DevOps to create true agile builds within development cycles. However, this new kind of environment brings new set of security threats at every phase of this cycle—from unvalidated software entering the environment, to secrets being leaked, to runtime drifting and breaking immutable behaviors. By outlining common security risks and practical use cases across every phase, this session helps security teams better understand how to efficiently manage security at the speed and scale of DevOps. Ths webcast will also include a live demo and Q&A with the speaker. Risk management in the age of DevOps and public clouds requires organizations to automate real-time visibility and tracking of their SSL certificate deployments. However, doing this is a challenge amidst the scale, speed and elasticity of assets and certificates in today's enterprise. Learn how Qualys CertView helps customers extend DevSecOps to prevent downtime and disruption, audit and compliance failures, and mitigate risks associated with expired or weak certificates and vulnerable TLS configurations. Real-time change detection has become a critical element of maintaining operational hygiene across rapidly changing assets typical of DevOps infrastructure. This talk will introduce how Qualys File Integrity Monitoring identifies and tracks change incidents across global IT environments. Learn how customers are using FIM to efficiently correlate events, quickly identify and filter out noise, and track review of incidents to meet compliance requirements." High profile breaches are contributing to an increasingly regulatory environment, both regionally and globally. This talk highlights the latest IT security and compliance challenges and discusses best practices to streamline compliance and risk programs using the Qualys Cloud Platform and its integrated Apps. Learn how to assess security configurations of IT systems, wherever they reside, log and track file changes across IT systems globally, help security teams implement the CIS 20 Critical Security Controls. automate collection and reporting of compliance data for both technical and non-technical controls and automate and standardize vendor risk assessment. Also, learn how companies in and outside of the EU can assess and maintain compliance with the EU's General Data Protection Regulation (GDPR). The need to test web applications and APIs for vulnerabilities in an automated fashion is greater than ever. Testing resources are scarce and new code is being written at breakneck speed while the business wants it deployed to production immediately. Learn about new tools and capabilities in Qualys Web Application Scanning (WAS) that are being introduced to help you integrate application security testing into this fast-paced, DevOps environment. Containers are changing the IT landscape, empowering developers and operations with agility and scale that match the speed of business. Security teams must adapt to this transformation with new tailored methods to prevent threats and vulnerabilities in the Container environment. Learn how, with Qualys Container Security, you can gain total visibility and incorporate security into the DevOps cycle to harden and remove vulnerabilities before a container environment is operational. Understand how to secure the build environments using Jenkins vulnerability analysis plug-ins, and track runtime to identify containers not conforming to the immutable behavior. Qualys provides comprehensive security coverage across workloads and resources in your public clouds. This session covers information on the available solution, deployment methodology and new features being released. Also, learn from three case studies from customers, including Capital One, on how you can automate securing DevOps for your public cloud workloads. Qualys introduces CloudView, a new app that helps security teams gain visibility of complete public cloud infrastructure and continuously monitor and secure it against misconfigurations, malicious behavior, and non-standard deployments. This talk focuses on how to use Qualys Asset Inventory to enable instant, global visibility of IT assets across all environments – with comprehensive, up-to-date and normalized inventory. Attendees will learn how Asset Inventory provides a cohesive structure with automatic classification of technology, powered by our continuously curated product catalog. Qualys customers can now rationalize hardware and software to make strategic decisions across IT and Security. The scalable and centrally managed Qualys Sensors provide a wide range of asset data collection capabilities, including agentless, agent based and the latest addition, passive discovery. To address the challenges of vulnerability detections increasing year over year, Qualys is introducing new ways to visualize vulnerability data, layering Real-time Threat Information on top of detected vulnerabilities to provide consistent and automated remediation prioritization. Qualys is bringing AssetView technology to Qualys Vulnerability Management, allowing users to instantly search across vulnerabilities and create dynamic widgets and dashboards within the VM module. See the new VM Dashboard and instant search capabilities, a demo of Qualys Threat Protection, as well as a sneak peek at our new Reporting Module that will unify reports across the Qualys Cloud Platform. As organizations accelerate their move to the cloud, securing their hybrid IT environments becomes dependent on building a unified approach to prevention and detection of breaches across global IT assets - whether on premises, endpoints, cloud, mobile or IoT. This talk will outline how enterprises are using the Qualys Cloud Agent to provide continuous Asset Management and Vulnerability Management for on-premises systems, user endpoints, and cloud instances. A new Indication of Compromise (IOC) app now also monitors, records, and analyzes millions of system events to deliver scalable threat intelligence verification, hunting and suspicious activity detection, and malware family detection for security analyst and incident response teams of all sizes. This expansion also extends the Qualys Cloud Platform capability to automate response with Patch Management. Learn how to deliver InfoSec, Endpoint, DevSec, and Cloud teams a single platform to secure an evolving global IT environment at a lower cost. Qualys Chief Product Officer Sumedh Thakar discusses how organizations can leverage continuous visibility of IT assets to deliver Transparent-Orchestration(TM) of security at the epicentre of the digital transformation. This talk will discuss how companies can regain visibility across their hybrid IT environments, consolidate their security and compliance stack to make it more effective and less costly, and safeguard their digital transformation. Sumedh will also discuss the 2018 roadmap for the Qualys Cloud Platform and its integrated Cloud Apps. He will cover new forthcoming and groundbreaking apps and services and highlight customer use cases for building security in and not bolting it on. As companies embrace technologies such as the Internet of Things, big data, cloud, and mobility, they must make security more than an afterthought. Qualys Chairman and CEO Philippe Courtot will discuss how In this digital era, the focus needs to shift from securing network perimeters to safeguarding data spread across systems, endpoints, and the cloud. He will also deliver an update on Qualys and how the company is helping customers worldwide move effortlessly into this new digital age while building in end-to-end security. Asif Karel, Director of Product Management, Certificate Management, Qualys Inc. Effective certificate management is critical for every organization, especially to prevent risk of breaches and unplanned outages. Having complete visibility into certificates, underlying SSL/TLS configurations and Certificate Authority policies, enable organizations to continuously and effectively protect their digital assets. Join Asif Karel, Director of Product Management for Qualys CertView, to learn how your organization can discover, monitor and create an inventory of certificates. This webcast will also include a live demo and Q&A with the speaker. Hari Srinivasan, Director of Product Management, Qualys Inc.
As organizations start moving workloads to public clouds, they are encountering new cloud native security threats and compliance challenges as a result of lack of visibility and no clear understanding of shared security responsibility. Issues like leaky storage buckets, misconfigured security groups, and erroneous user policies create new attack surfaces that will lead to the vulnerable and non-compliant workloads. - Automate security into your DevOps pipeline and block threats from entering into your production cloud deployments. public clouds and how to continuously assess and monitor cloud assets and resources. Learn to effectively navigate the security risks, new regulations, and new technologies on your journey to a secure and compliant digital transformation by participating in this Qualys webcast series. In this episode, Tim White, Director of Product Management at Qualys, will highlight the latest IT security and compliance challenges and discuss best practices to streamline compliance and risk programs using the Qualys Cloud Platform and its integrated Apps. In this webcast, Chris Carlson, Vice President of Product Management at Qualys, will discuss digital transformation trends and how the use of new IT methodologies and technologies like DevOps, Agile development, elastic cloud computing, and containers are changing the security development life cycle. Learn how to ensure web application security, from development to deployment and beyond. The combination of today’s fast changing IT environments, increasingly common “headline” vulnerabilities and swift weaponizing of exploits requires a more automated, continuous and precise approach. Defense methods such as IT asset inventory, vulnerability management, threat prioritization, and patch deployment all must adapt with new speed and scale to deliver continuous visibility of global IT assets and environments for the realities facing today’s digital business. Join Qualys along with featured guest speaker Josh Zelonis, Senior Analyst at Forrester, to discuss the practical realities of prioritization in the era of digital transformation, industrious attackers and headline vulnerability disclosures. How can security teams sort through thousands or millions of vulnerabilities in time to prioritize a subset of those, act appropriately, then report up the chain? See a live demonstration of Qualys Container Security, the industry-leading solution for addressing security of containers in DevOps pipelines and deployments across cloud and on-premises environments. Learn how Qualys helps customers worldwide comply with the European Union General Data Protection Regulation (GDPR). Join us for this informative technology series for insights into emerging security trends that every IT professional should know. These brief sessions will give you an opportunity to discover best practices from market leaders as well as hands-on advice from industry experts on a variety of security and compliance topics. Let Qualys help keep you up-to-date with cost-effective and efficient technology trends. Choose the topic that interests you or plan to attend the entire series to make sure you stay ahead of the curve.